Many moons ago, at a restaurant now long closed, we used to save our college student pennies to go and order a warm spinach salad with walnuts and blue cheese and a glass of wine and feel sophisticated. This is a ​much-improved version of that very good salad. Kale's hearty texture, even when softened with steam as it is here, stands up to the crunch of toasted walnuts and pungency of good blue cheese heaps better than spinach ever did or could. And the various textures make it rather fun to eat to boot. The kale and walnuts pack plenty of nutritional power into the bowl, and the blue cheese brings a nice touch of indulgence. Rinse the kale leaves and cut off the tough ends of their stems. Fussy folks can go ahead and cut out the thick stem from each leaf as well. Chop the kale into bite-size pieces or thin ribbons. Bring about half an inch of water to a boil in a large pot. Set the kale in a steamer basket or colander that fits in the pot, set it in the pot, cover, and cook until the kale is tender to the bite, 3 to 5 minutes. Lift the steamer basket or colander out of the pot. Let the kale cool off until cool enough to handle. Either use your hands to squeeze excess water out of handfuls of kale at a time or lay the steamed kale on a clean kitchen towel and roll it up tightly so the towel absorbs the excess water. 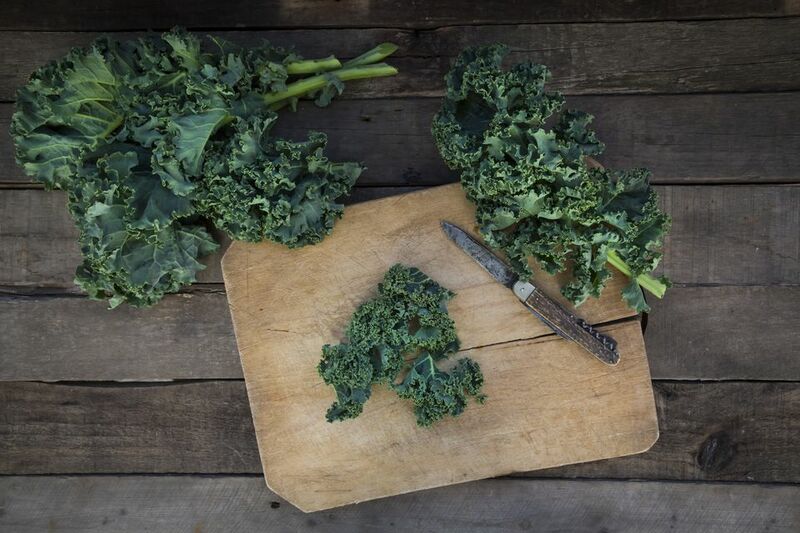 Use your fingers to fluff up the squeezed-out kale (it bounces back beautifully!) and add it to the salad bowl. Toss the kale with the dressing in the bottom of the bowl and let it sit for a few minutes. Sprinkle the salad with the walnuts and blue cheese. Serve the salad while still slightly warm or at room temperature.